What is a Jet Pump? Manufactured to specified finish and concentricity, assuring performance vastly superior to that of competitive units. Eductors operate on the basic principles of flow dynamics. This involves taking a high pressure motive stream and accelerating it through a tapered nozzle to increase the velocity of the fluid. 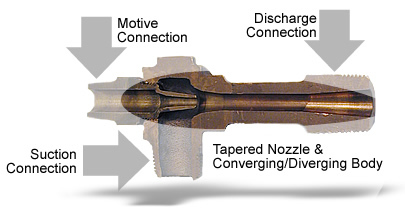 Gas Motives are compressible fluids and are put through a converging-diverging nozzle. The gas can exceed the speed of sound. This fluid is then carried on through a secondary chamber where the friction between the molecules of it and a secondary gas (generally referred to as the suction fluid) causes this secondary gas to be pumped. These fluids are intimately mixed together and discharged from the eductor. All models are Full ANSI Rated. Wrench flats at pipe connections prevent damage to unit on installation and removal. Ultra-smooth machining of nozzle finish. Vacuum-tight and leak-free 0-ring seal. Machining of mixing tube to specified finish. There are three connections common to all venturi eductors. Eductor MOTIVE Connection: This connection is where the power for the eductor is generated, by increasing the velocity of the motive fluid. The eductor nozzle in this section takes advantage of the physical properties of the motive fluid. Eductors with liquid motives use a converging nozzle as liquids are not generally compressible. Eductors with gas motives utilize converging-diverging nozzles to achieve maximum benefit from the compressibility of the gas. All eductor nozzles for eductors have smooth flow paths. Flow paths with sudden steps or roughness on these high velocity surfaces cause jet pumps to operate less efficiently. SUCTION Connection: This connection of the eductor is where the pumping action of the eductor takes place. The motive fluid passes through the suction chamber, entraining the suction fluid as it passes. The friction between the fluids causes the chamber to be evacuated. This allows pressure in the suction vessel to push additional fluid into the suction connection of the jet pump. The high velocity of the motive stream in this section of the eductor directs the combined fluids toward the outlet section of the eductor. Discharge Connection: As the motive fluid entrains the suction fluid, part of the kinetic energy of the motive fluid is imparted to the suction fluid. This allows the resulting mixture to discharge at an intermediate pressure. The percentage of the motive pressure that can be recovered is dependent upon the ratio of motive flow to suction flow and the amount of suction pressure pulled on the suction port. The mixture then passes through the diverging taper that converts the kinetic energy back to pressure. The combined fluid then leaves the outlet. Maximum Suction Lift -27ft. -27ft. -27ft. -20ft. -20ft. Minimum Required NPSH 3ft. 3ft. 3ft. 13ft. 13ft. Pumping Liquids. For such a usage, a liquid motive is used to pump another liquid. This is extremely beneficial in areas where an electric pump might present an explosion hazard, or where electric lines might not be available such as when draining a sump. Other typical applications include pulling an acid or base into a water stream in order to dilute that acid or base, and for boosting the NPSH (Net Positive Suction Head) of another pump. Heating Liquids. Using steam as the motive force to pump a liquid also works to heat the liquid. For example, when drawing water from a pond, the need exists to warm that water as it's being supplied to a process. The eductor performs two functions in one. Other applications include heating process fluids in line, cooking slurries in line, and heating reactor jackets. Pumping Gases. In this case, liquid is again used as the motive force. One typical application is the aeration of a liquid in order to reduce BOD (Basic Oxygen Demand) of the fluid. Others include exhausting vapors or gases from a room, evacuating a vessel, scrubbing fumes from a gas, or creating vacuums. In addition, should there be a need to inject air, ozone, chlorine or other gases into a process liquid, eductors will perform that function efficiently and effectively. Eductors offer many advantages over electric pumps. They feature design simplicity, without rapidly rotating parts that are subject to leakage, wear and breakage. Eductors are generally small in relation to the work they do, and they are low in cost. They are easy to install and require few adjustments. They are easy to inspect and clean, and never require lubrication. In addition, they are ideally suited for use in hazardous locations, without the need for explosion proofing as may be required with electrical equipment. Eductors feature an advanced design to assure flows better than those of other eductors. 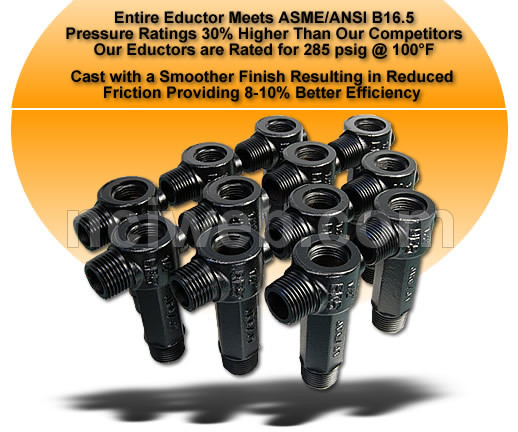 Unlike typical cast units, which meet only a nominal pressure rating, Eductors meet rigorous ANSI specifications. All of our eductors have a smooth specified finish for critical flow paths. In comparison, sections of the flow paths in competitive cast units may be left rough to keep production costs down. Also, the mixing tube section of Eductors has been designed to withstand the stress to which it will be subjected. This is the point at which many other makes are weak and subject to breakage during installation. All units have wrench flats to prevent damage during installation. Providing a smooth flow path is critical to optimum eductor performance. As a result of this feature, the motive fluid achieves more velocity through the eductor body, and this means more energy is used for pick-up of the suction fluid. Also, better flow paths in the diverging section of the eductor allow it to achieve better discharge pressures.